This video is an interview with Hassan Khan, we will discuss “how to start freelancing in Pakistan” in 2018. 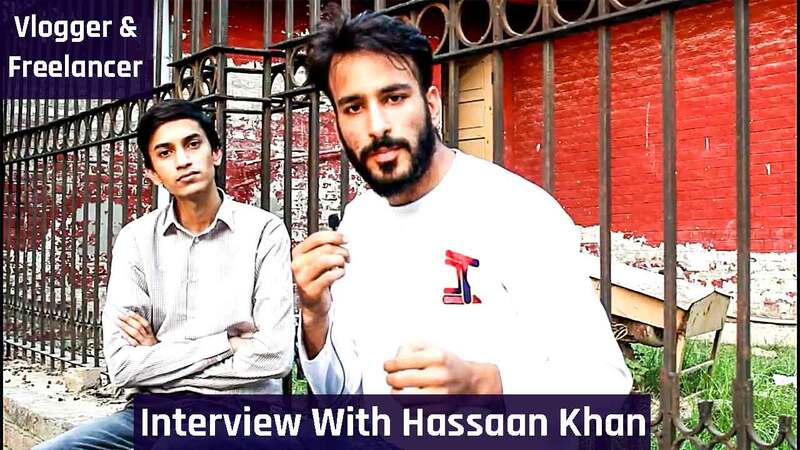 Hassaan Khan is a Pakistani vlogger, blogger and Freelance writer. Hassan Khan talks about his journey in a freelance career. We also discuss how to start freelancing in Pakistan If you have an entrepreneurial spirit and have a skill you want to pursue. Freelancing is a type of business where individuals can work independently to provide different services. There is no specific job, a company hired you for a specific job and for a specific period of time. Freelancing is one of the fastest growing business all around the world. You can work as a part-time or full-time freelancer depending on your choice. It’s easy to combine these traits and start freelancing in Pakistan either on the side or as a career. However, where freelancing is an enticing prospect, it does require serious contemplation, dedication and a plan of action. Pakistan has the top freelancer around the world. Every year Fiverr rank Pakistani freelancer on top among the other freelancer around the world. You can also start freelancing and can make living from it. Now, the question is ‘how to Start Freelancing in Pakistan’? Well, it can be difficult to know where exactly to start. Here are the steps that you can follow to start freelancing in Pakistan. How to Land a Project Apart from following these steps and the mentioned video, it is important to believe in yourself and have the confidence that you can do it. You must have expertise in your field to satisfy your customer. The more clients you impress, the more likely you are to find more work. The key is confidence, consistency and creating a history of success which speaks louder than words. Find a job that best suits you. Just imagine the things around you and try to find the result what suits better to your personality. Find a work that keeps you fresh all day. For example, if you ask me what I love to do? The simple answer is I love video editing, It keeps me motivated and I never get bored while editing the videos. Fiverr is a well-known freelancing platform. It is most suitable for beginners as you can start your gig from 5$ as a beginner. You can build your own brand by consistently working on Fiverr. All you need is to make long term relationships with your clients. I know many people in my circle who are working on Fiverr. They have built their own brand after getting experience from Fiverr. Upwork as another famous freelancing platform where you can find the project of your desire. Unlike Fiverr, you don’t need to start your gig from 5$. You can earn even 200$ or more from your first project. Freelancer is another platform you should try. As the name suggests, it was built in 2009 for providing the facility to freelancers. It mainly works on the basis of the bid. You have to find a suitable project and place your bid with details. Starting the freelancing is an easy job but what matter is the consistency and achievements of your goals. You need to be consistent. Sometimes, you have to wait for several months to get your first project. You need to have good communication skills if you want to get hired. Try to make a long term relationship with your clients. It will help you in getting the more projects in the future. Another most important factor is your profile at freelancing platform. You need to have professional design images to attract the client. Now, grab a cup of coffee and think about your expertise. You don’t need to be born expert, you can learn from people around you. Read books, watch movies, listen to podcasts of expert people in your field.